When you’re unsuccessful at conducting an online search for an ancestor, it can be due to a number of reasons. The good news is that by simply changing the way you search for your ancestors can save you even more frustration and discouragement when you hit those genealogy brick walls. The even better news is that if you cannot find your ancestor online, Genealogists.com most likely will find your ancestor offline in any of the over 2,000 archives worldwide where they do research. These common genealogy research mistakes may be prohibiting you from finding your ancestors online. Are you guilty of any of them? It’s true. One of the biggest reasons why you continue to search for months and still can’t find your 3 times great uncle online is because records of his life aren’t online at all. This is one reason why researching family history and genealogy offline is just as important as using online tools. Searching big ancestry and genealogy sites that have large databases is sometimes not enough to find those elusive ancestors. So it’s important to use offline collections, head to genealogy libraries, ask local historical or genealogical societies for help, get your family members involved in your research, ask Genealogists.com for help, and book your flight to a major genealogy or family history conference to fill your noggin with new know-how and tricks of the trade. Keep in mind that sometimes, you may not be able to find ancestors at all by searching on or offline because back in the day, many records weren’t kept. It’s important to know that you’re not alone in this, and to take a deep breath, relax, and step away from your research for a while to recharge your research batteries. When you’re searching online for surnames, you should also think about searching for first names as well as any known nicknames of your ancestors. If you know where a certain ancestor lived, and know his first name, search databases for that first name as well as that ancestor’s location (i.e., “Joe” and wife “Marie” in Fresno, California). This search tactic will also be helpful just in case your elusive ancestor’s surname is misspelled in the records. Searching for nicknames is also a good idea as your ancestor’s real name may not be recorded, either. This could be the exact reason why you aren’t finding him! This blog post by genealogist and family historian, Lisa Lisson will help walk you through how you can find ancestors by searching for nicknames online. Sometimes, the records themselves actually have it all wrong! People make mistakes, so names can certainly be misspelled and indexes can be mistyped. Because your elusive ancestor likely didn’t write any of these records himself, the information can be incorrect. So what can you do about it? Deliberately search for misspelled names or variations of surnames. Perhaps the surname you’re searching for is McDonnell. You should also try searching for McDonell, McDonnel, or even MacDonnell. You may also want to search MDonnell (just in case the ‘C’ was left out by the transcriber). This simple step may be all that’s needed to find your long-lost ancestor — and find other ancestors along the way! When searching online databases for ancestors, it’s important to use boolean search phrases such as words (AND, OR and NOT) and symbols (-, “) to help you pinpoint exactly who you’re searching. Rather than typing in “Joe Smith born in 1857,” use some operator words in your search like this: “Joe Smith OR Smithe born 1857 NOT Smyth”. For more help with boolean search phrases, reference this tutorial from The Colorado State University. Are you searching for your ancestors on Google? You will need to use symbols for that. Thankfully, Google provides their own handy guide that walks you through what each of the symbols mean. Mastering these boolean search tactics will help you become a better researcher and find your ancestors much easier. If you still can’t find your long-lost ancestor online, there are a plethora of social media resources that can help. 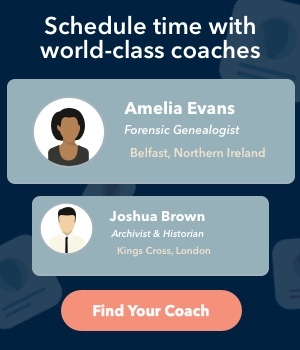 Because you’re already searching online anyway, one of the best steps to take is to get connected to other passionate family historians and genealogists just like you in the fast-growing genealogy social media community. You can do this by signing up on Twitter, Facebook, and Pinterest to search for, follow, and interact with other genealogists, family history aficionados, genealogy bloggers, and even professional genealogists. They are always happy to help and willing to share some of their favorite tips. Two of the best and most popular Facebook pages are Genealogists.com and Genealogy! Just Ask! Many people have found long-lost family members just by using social media resources, so get on these sites or start your own blog ASAP! You might want to organize your searches to start finding more ancestors! You’re most likely not going to find them without an online and offline research plan in place. Simply searching on Google or starting an online family tree in hopes that your family members will fill in the gaps in most cases is not enough to find your ancestors. So, clean up your workspace, create a log of what you plan to research, and stick to it. There are even free genealogy research templates to keep you on track with your goals. Try these research templates from Family Tree Magazine. If you haven’t tapped into historic newspaper research in order to find ancestors, you need to get on this crucial part of genealogy searching, pronto! Newspapers can be very useful in finding information about your relatives. They provide obituaries, marriage and birth announcements, old photos, and fascinating stories to add to your family tree. Many genealogy and family history websites offer online newspaper search features. This blog post by Kenneth R. Marks, author of The Ancestor Hunt, shows how to search online for newspapers to help you find more information on your elusive ancestors. It’s important to know that genealogy and family history research can take up a lot of your free time. Remember that going in with an open mind and introducing new online research skills to your plan can help you find more of your long-lost family members. 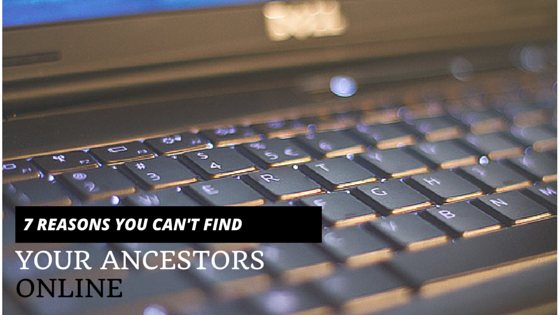 Do you have other tips for those who can’t find ancestors online? Let us know in the comments! This entry was originally posted by Crestleaf in Genealogy 101, Genealogy Resources, Genealogy Tips and tagged family history tips, genealogy brick wall, genealogy tips on July 29, 2015 by Natalie L..
Like what you read? Subscribe to the Genealogists.com blog above and automatically receive our next article. Announcing FourBears Books: Customized Children’s Books about Your Family! I have found that by looking at the neighbors sometimes you can find Aunt Sally living with a married daughter or a grandchild!